James Van Alstyne was born August 24, 1966 and strangely came to poker via the blackjack tables. Unlike many other poker professionals, James wasn’t a blackjack dealer, he was a professional blackjack player. He used his card-counting techniques to win at blackjack, and he was so effective that he ended up being barred from several casinos. This did not discourage him, however, and he wore a baseball cap to protect himself from casino security. The cap has now become a regular part of his attire at the poker table. James Van Alstyne switched over to poker when the casinos changed their blackjack rules and he lost his edge. James Van Alstyne’s best poker game is Omaha 8 or Better, as he finished in the money in this event three separate times at the World Series of Poker between 1994 and 1998. In 1999 he had his first money finish at the WSOP Main Event, where he finished 16th. James Van Alstyne then left poker for a while, and proceeded to lose a million dollars on the stock market. 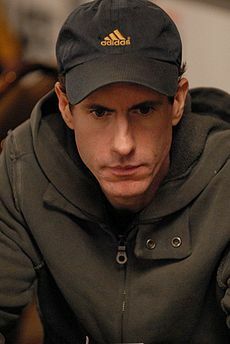 In October 2004, James won the WPPA Championships of Poker, and later in October he won the first season grand final of the Ultimate Poker Challenge. James has also made two World Poker Tour final tables. James Van Alstyne has had 16 first place finishes, and has won more than $3 million, including tournament winnings.